Tears filled the Miami clubhouse. For the second consecutive year, the Hurricanes missed out on the postseason, bringing legendary coach Jim Morris’ career to a close. After Ron Fraser and Morris combined to lead Miami to four national championships and 25 trips to the College World Series, longtime assistant coach Gino DiMare has been bestowed the responsibility of taking the Hurricanes back to Omaha. 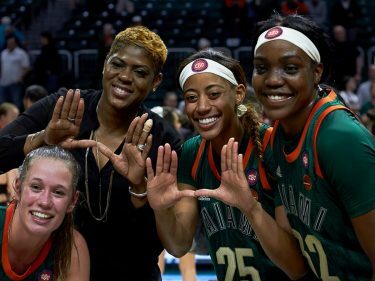 Miami finished 28-26 last year and 31-27 in 2017 after making the playoffs for 44 consecutive seasons—the longest streak in any college sport in history. 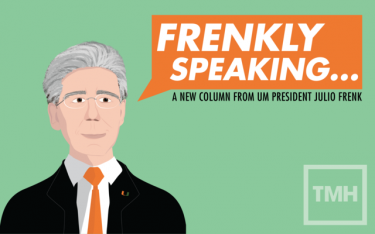 However, with a new skipper and renewed mindset, UM is poised to start a new postseason run. The Hurricanes will rely on a pitching staff with plenty of experience, led by 2018 All-ACC Third Team selection Evan McKendry. The right-handed pitcher finished with a 3.52 ERA and became the first Miami hurler since Bryan Radziewksi in 2014 with 100 strikeouts in a season. McKendry, McMahon and junior Greg Veliz will likely form Miami’s weekend rotation with standout freshman Slade Cecconi—who ranks No. 2 among impact freshman in the Atlantic Coast Conference, according to D1Baseball.com, assuming the midweek spot. The Hurricanes batted .257 and scored just 4.8 runs per game a season ago, which ranked 11th and 13th, respectively, in the conference. 2018 Freshman All-American Freddy Zamora was one of the lone bright spots. Zamora hit .303 with 28 RBIs and was the lone Cane to start all 54 games. Miami also brings back heralded high school prospect Alex Toral, who struggled in his freshman campaign. The first baseman batted just .161 with only one home run and 11 RBIs in 33 games. Several other key returnees in the lineup include catcher Michael Amditis, who was limited to just 24 games because of a hand injury, and infielder Willy Escala. Additionally, the Hurricanes welcome the 10th-ranked recruiting class, according to Baseball America. Cecconi, two-way player J.P. Gates and catcher Adrian Del Castillo headline the freshman class. “J.P. Gates is going to get the opportunity to be the closer. He’s a very tough freshman,” DiMare said. “Del Castillo swings the bat as well as anybody we’ve had here in a while as a freshman. 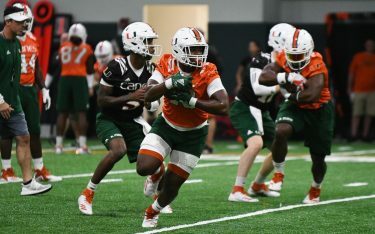 The 2019 Hurricanes have 32 players on the roster with just seven juniors and zero seniors. Despite having a young team, the Hurricanes still have their sights set on making it to the CWS. Miami will begin its road to the CWS against the Rutgers Scarlet Knights 7 p.m. Feb. 15 at Alex Rodriguez Park at Mark Light Field.